How to Show Popular Post Using Blogspot Popular Post Widget/Gadget? As a blogger or writer, of course we want visitors read our writing or posting. To facilitate the visitors looking the most popular posts, we can install popular post widget. Fortunately now been providing widgets popular bloggers post. Blogspot users simply add this widget in the sidebar and most popular postings will automatically appear. How to install popular post widget/gadget on blog? Simply, go to Page Element, click add Gadget whenever you want. Choose Popular Gadegt and automatically displays a list of popular posts on your blog. Good post. Thanks for the help. Thanks for the info! I just did it in my blog and looks great! very niice post. its very useful information for beginner. This is very good information, I was wondering the same thing, how can I do it. Good info for those wanting to get the most out of their blog. Thanks for sharing. Another way to get your website out their is my advertising it on a some custom t-shirts and than make your friends wear them everywhere they go. The post is written in very a good manner and it contains much useful information for me and i am sharing with my frieds. It was great to read this post. I enjoyed it and this blog is more informative very nice post. It is very popular and more interesting so that can be enjoy it. Mostly people are very like it and enjoy it. To facilitate the visitors looking the most popular posts, we can install popular post widget. 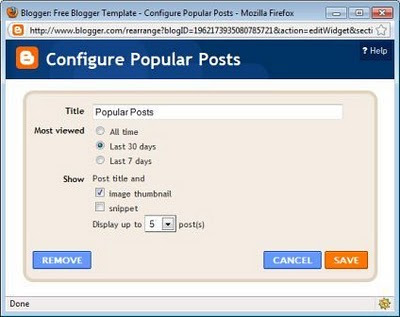 Providing widgets popular bloggers post. Blogspot users simply add this widget in the sidebar and most popular postings will automatically appear.